CURES Workshop Summary – microBEnet: the microbiology of the Built Environment network. 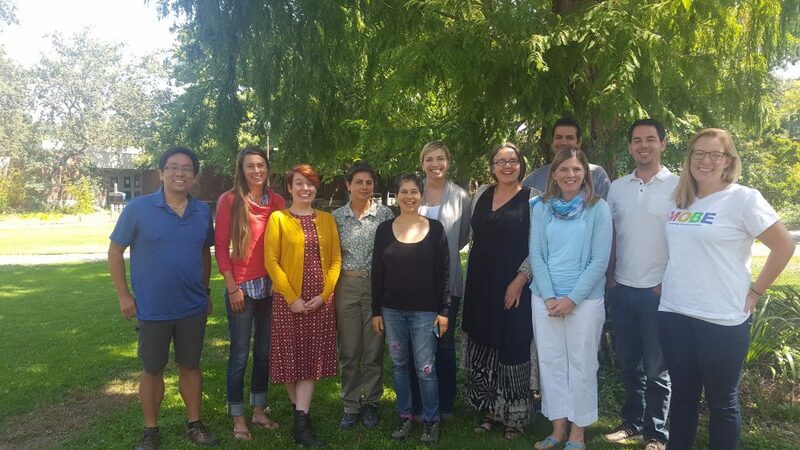 The past few days I have been attending a workshop by Erin Dolan of the CURES program (Course-based Undergraduate Research Experience) at Santa Rosa Junior College. More than ever, courses are transitioning from the traditional lectureship structure to a hands-on interactive research approach. We came into the workshop with a course already in mind, and used that as the basis for all of the exercises and activities of the workshop. CURES Workshop Participants SRJC August 15-18, 2016. Every day, we worked and revised the outline of our research and student goals. This was hard! Research goals are tangible tasks like design an experiment, create a publication; student goals involve a lot of learning and exploring around the curriculum’s objectives. Once we had listed a few goals, we brainstormed concrete tasks and ideas per Research Goal/Student Goal that satisfied all of the objectives — you’d be amazed at how many components appear when doing this. Often, the research goals and student goals conflict. A separate conflict brainstorming session ensued, where we realized what typical conflicts were and how to overcome them. For example, time is the biggest enemy when it comes to planning a CURE. The time it will take to teach students new techniques, fit all of the content of the traditional curriculum into a CURE, repeat failed experiments, keep all students on the same page, incorporate valuable assessment and/or learn from existing literature, etc can be overwhelming. It’s a lot, but yet another activity made us aware of resources and tools available to us to help alleviate concerns about designing a CURE. Regardless of whether designing a new course or simply vamping up your own course, I think it’s important to consider who plays an instructional role at the institution and for the class. Diversifying and delegating the instruction can add a lot of value to a course with (hopefully) minimal effort. Guest speakers, graduate students, alumni of the course, teaching assistants, research collaborators, librarians, and lab technicians can all help in teaching roles. There are a lot of benefits in using online resources to save time and add value to a course. Online lab notebooks, for example, allow students to access their notebook from anywhere, easily add pictures, and organize their work. There are incredible amounts of online tools to engage students in class participation, my favorite being Plickers — a less-problematic form of the clicker setup. It took me a while to realize this, but you really can have students do ALL of the work! Have them make their own grading rubrics, have them grade/assess each other, have them pick the research questions and gather what they need. Even if you’re not doing a CURE, this is so empowering to students and makes your life a lot easier. Equity and inclusion of all students came up a lot in the context of non-traditional teaching settings. Classic traits of diversity in a classroom may not be representative of the types of resources students bring to a course such as prior experience or technology access. We thought about strategies to level the playing field in a classroom, which was very insightful. Deliberate selection for student grouping, extremely clear assessment guidelines and expectations, and even catering to different personalities can work wonders in a classroom. For example, extroverts and introverts have polar ways of speaking up in a classroom setting. Tools like being able to ask anonymous questions during a live Google Slides presentation target this problem. There is an insane amount of literature online about the success of CURE programs, validated assessment tools, rubric generators, finding funding, locating potential collaborators, creating and the value of a sense of community in a classroom, etc. If there is something that is of interest to you, I am happy to share the resources that we shared in the workshop related to these topics. Please contact me for more details on these topics! I would highly recommend taking one of these workshops if you are serious about flipping a course on its head and having the students do hands on approaches to a course. It was inspiring, constructive, and an insanely helpful brain dump of all the cool tips and tricks people use for their courses.